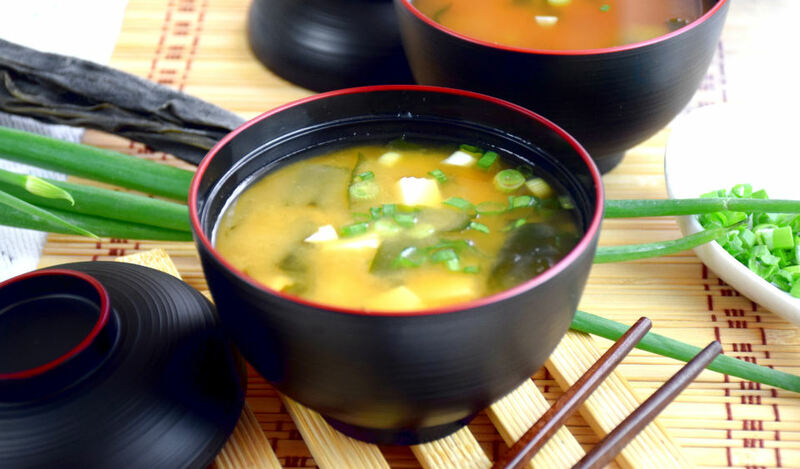 Do you want to make the miso soup that rivals any Japanese restaurant at home? I have the miso soup recipe for you. 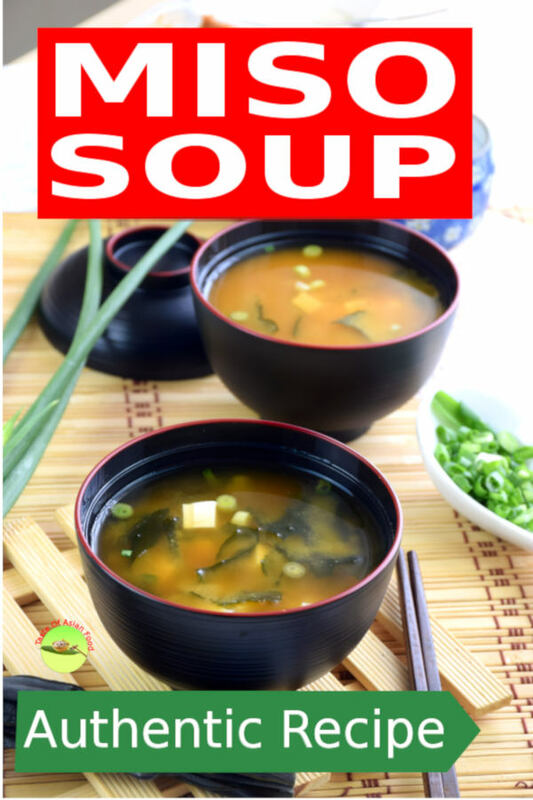 Miso soup 味噌汁 is a warm and comforting Japanese soup prepared with a soup stock (Dashi) and miso paste. It is the soul food for the Japanese which serve together with rice. Many non-Japanese are familiar with miso soup as many Japanese restaurants serve it with rice, salad and the main dish as the bento set. Most of them will prepare the basic miso soup with wakame, silken tofu, and scallion. This article explains how to prepare the basic miso soup. Let’s take a look at this savory Japanese miso soup recipe with an elusive flavor. It is easy, only three ingredients for the soup base, and three more for the ingredients. Add miso paste and the rest of the ingredients. Dashi is the Japanese word for broth. The soup base is prepared with two ingredients, kombu 昆布, .and katsuobushi 鰹節. Dashi is the foundation of a good miso soup recipe. Kombu is the edible kelp widely available in East Asia. The Chinese called it as 海带 and use it as a precious ingredient in culinary. 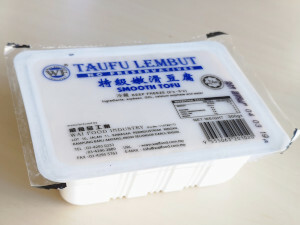 It is usually sold in the in dry form as shown. The type of kombu for preparing dashi is the older type, which is tougher but with more flavor. Kombu from Hokkaido is generally considered to have the best quality. Clean the kombu with a damp cloth. Do not remove the white substance on the surface, as it is full of umami (flavor). Place it in a pot of water and soak it for at least three hours to extract its flavor. If you have enough time, soak it in water overnight or up to a day will yield a better result. According to the Michelin star chef from, Kikunoi restaurant at Kyoto, the best temperature to extract the flavor of kombu is at 60°C. I know this is difficult to do it even in the restaurant, not even mention as a home cook. So I soak it for a day which yields an outstanding result too. After soaking, bring the water temperature up to nearly boil, and remove the kombu immediately. Boiling the water will extract other undesirable components from the kombu and yield bitterness a flavor. This happening is similar why we should not use boiling water to brew coffee, in which the coffee will turn bitter. It will also release mucilaginous compounds that make the dashi viscous. The kombu will turn mushy and will affect the texture of the soup. Dashi should be a clear soup, just like a consomme. If you are a vegetarian, you can use this stock to replace the dashi with katsuabushi in the miso soup recipe. Otherwise, proceed to the next step to add some katsuobushi. The addition of katsuobushi will make it even more flavorful. 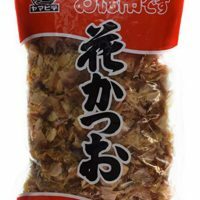 Katsuobushi is the dried, fermented skipjack tuna flakes. It is deliberately fermented which results in distinct umami. It is available in most of the Asian grocery shop where you can get the dried kombu as well. After removing the kombu from the stock, heat the dashi to barely below boiling point. Add the katsuobushi. Michelin star chef from Kikunoi restaurant suggests that the best temperature to extract the flavor of katsuobushi is about 80°C. He explained it should never boil the katsuobushi to avoid extraction of unwanted elements with a bitter taste. Let the katsuobushi steep for 5 minutes at the sub-boiling point. Strain through a cheesecloth or kitchen tissue to remove all the katsuobushi. The final product should be a clear soup with a slightly yellowish color. Once the dashi is ready, you can use the stock to make miso soup. There is no fixed ratio of ingredients to prepare the Dashi. You can use the following formula to make a relatively strong Daishi. If you intend to make the miso soup added with other ingredients, such as carrots, daikon, cabbage or mushrooms, increase the amount of water for milder dashi. You can change the quantity of kombu and katsuobushi, or even add more water. 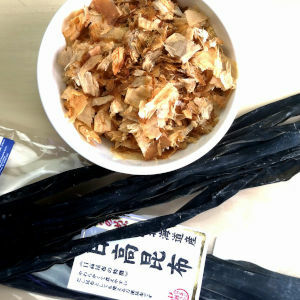 Increase the amount of kombu if you go for the vegetarian version without katsuobushi. You can keep the dashi up to 1-2 days in the refrigerator or 2 weeks in the freezer. Therefore it is possible to make a large batch and keep in separate containers for your next cooking sessions. There is a chawanmushi recipe in this blog which required dashi. It is a popular starter which is very easy to make. It is a good idea to fill the Daishi into the ice cube trays. This method makes it very convenient to remove any small amount you need from the freezer. I measure about two cups, i.e. 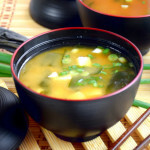 500ml to make two bowls of soup in this miso soup recipe and keep the remainder. Miso is prepared by combining the soybean with salt, grains, and koji (the fungus called Aspergillus oryzae). The combination is kept in a tight container to let it ferment for more than a year. 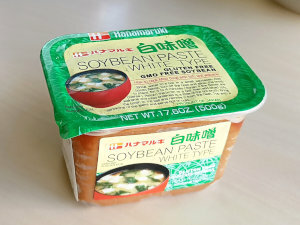 The result is the miso paste that we get from the store. Different types of ingredients added in the production process will determine the flavor of the miso paste. Generally, there are red/aka miso, white/shiromiso, and mixed/awase miso. White miso is sweeter and milder, and the red miso is saltier and with a stronger taste. 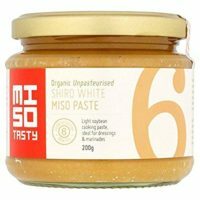 The choice of miso paste depends on your preference, much like you are choosing which types of cheesing in western cooking. You can also use a combination of misos to get a more complex flavor. Bring the dashi to a boil. Put the miso paste in the miso strainer, lower the strainer into the dashi and gently stir until it dissolves. The miso paste is quicker to dissolve by stirring it in the strainer. It also gets rid of the lumps that may exist in the paste. 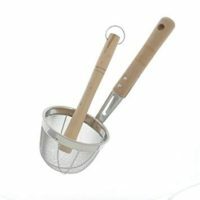 You can use any strainer if you do not have the miso strainer. It is important do not boil the miso as the components which contribute to the aroma will lose with higher heat. How much miso paste you need depends on the saltiness of and the intensity of miso flavor you want. As a general rule, use one tablespoon (about 20g) of miso for one bowl of soup (approximately 200ml). Any tofu is suitable for making miso soup, but the silken or smooth tofu is my choice. Cut the tofu into small cubes. Gently place the tofu cubes into the miso soup after the miso paste has dissolved to avoid breaking the tofu. Heat the soup again just to the point that the tofu is heated through. 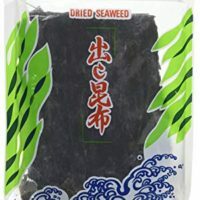 Wakame is seaweeds often sold in the dried form. You need to dehydrate it before use. Sprinkle some wakame in cold water to let it rehydrate for five to ten minutes until it expands. Pass through a strainer and gently squeeze the wakame to remove the excess water. The final ingredient for this miso soup is scallion. Cut the scallion crosswise into small pieces. Sprinkle some into the miso soup right before serving. Once you know how to make miso soup with the basic ingredients you can use the Japanese soup base (dashi). to prepare variations with different miso soup ingredients. You can use the dashi to prepare miso soup with vegetables, or even meat. That is, of course, a different miso soup recipe that needs to mention in a separate article. Scoop the miso soup into the dainty miso soup bowl. 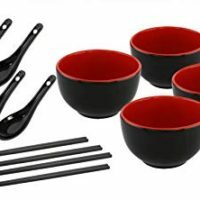 The exterior of these bowls is usually black with a bright red interior. Scoop out from the miso soup bowl enhance the Japanese feeling, and make it much more presentable. Dashi can be stored up to one week in the refrigerator. You can also fill up the ice cube tray with dashi or in the freezer safe container and freeze it. It can be kept in the freezer up to one to two months. However, once you have added the miso and other ingredients, do not keep the miso soup for more than a day as it will lose its flavor. Make the miso soup fresh with the frozen dashi yield a better result. Place it in a pot of water and soak it for at least three hours (better overnight) to extract its flavor. Heat the dashi to barely below boiling point. Add the katsuobushi. Strain through a cheesecloth or kitchen tissue to remove all the katsuobushi. Measure 500ml (2 cups) of dashi. Bring it to a boil. Put the miso paste in the miso strainer, lower the strainer into the dashi and gently stir until it dissolves. 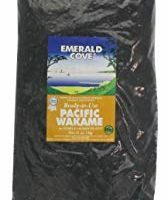 Sprinkle some wakame in cold water to let it re-hydrate for five to ten minutes until it expands. Add the wakame to the dashi. Add the tofu cube to the dashi. Sprinkle some cut scallion into the miso soup right before serving. 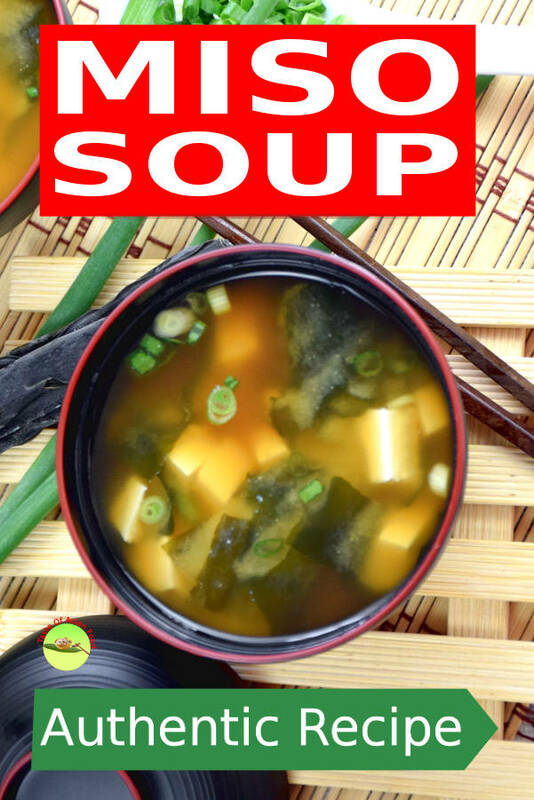 5 replies to "Miso soup- How to make with only 6 ingredients (easy)"
Hi, this is KP Kwan. I am happy to see you in this comment area, as you have read through my recipe. I am glad to reply to any questions and comments as soon as possible. I always have all the ingredients for dashi and miso soup on hand, but I seldom remember how much I love it. Thanks for reminding me of how delicious it is. Off to make a big batch of dashi and a small batch of miso soup! soak the rice with kombu. How should I use the combu in this case? You can clean the rice as usual, then add water plus a small piece of kombu to the rice. Before cooking, soak the rice in water with the kombu for thirty minutes. Let the flavor of the kombu release and the rice absorb more water before cooking makes better sushi rice.